One thing cigarettes have in their favour is that they’re simple to operate. Just take one out the packet, flick your lighter and enjoy that plume of carcinogenic soot and carbon monoxide. It’s just as easy in any weather, too – which is just as well, seeing as outside is about the only place you can (usually) still smoke. While you might suffer in the weather, though, your cigarettes will be fine as long as you shield them from heavy rain. Essentially, when you’re dealing with technology as primitive as a cigarette, the season doesn’t matter. E-cigarettes are obviously a lot more advanced than the old combustibles, and while that makes them superior it can cause the occasional issue as well. Cold weather is one source of issues, and some of them can seem pretty baffling. The good news is you can keep on vaping right through the winter with no problems at all, as long as you know how to get your gear set up properly. That won’t cost you much – if anything – and it isn’t difficult, but not all of it’s very obvious. It’s getting towards that time of year though, and according to assorted weather forecasters and migrating swans it’s going to be a long, cold wait for spring to come round again, so here’s our complete guide to winter vaping. When the weather’s cold your energy bills go up. You use the heating more, the long nights mean you switch the lights on earlier and you probably spend more time online or watching TV. 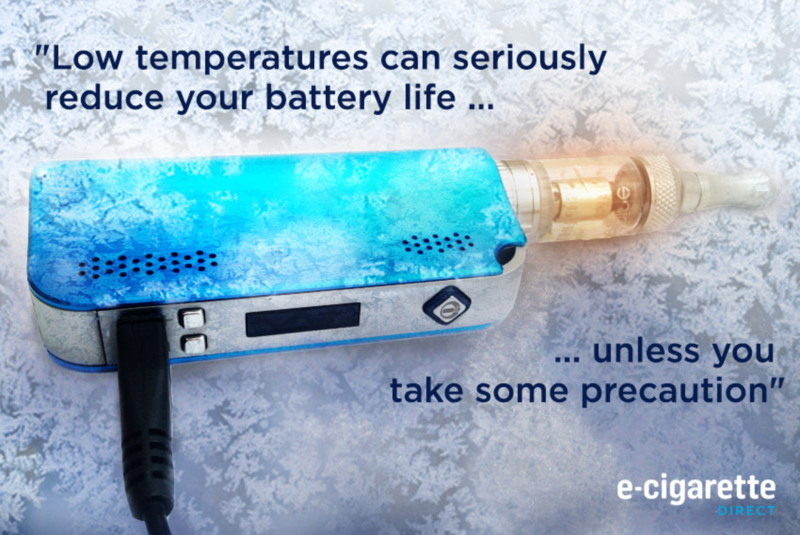 Your e-cig will have some different issues in cold weather. It uses the same amount of power as it does any other time, but low temperatures can seriously reduce your battery life unless you take some precautions. A e-cig battery is an energy store. When you charge it the electricity you feed in causes chemical reactions in the battery’s electrolytes, converting electrical energy to chemical energy. Once the battery is connected to a circuit the reactions go into reverse, feeding electricity back into the circuit – which in this case is your e-cigarette. Energy conversions are never perfectly efficient but it does work fairly well. The problem in winter is that as the temperature falls these chemical reactions become less efficient. Electricity is a flow of electrons around a circuit, and to get those electrons moving they have to be persuaded to leave the atoms they’re part of. It’s easier to get them moving when they’re at a higher energy level – and when the battery is cold energy levels are much lower. That means a lot more energy has to be used to get the electrons active before they can be kicked loose and sent towards your coil. Lithium ion batteries are most efficient between about 0°C and 60°C (32°F and 140°F), and below that range performance starts to drop off rapidly. At -10°C a fully charged battery will have about 70% of its normal capacity but the actual performance you get can be a lot worse than that. High drain increases the performance loss sharply, which is bad news for sub ohm enthusiasts – you can easily lose 50% of capacity at just a couple of degrees below freezing. You might also find the maximum voltage dropping off, to as low as 3.7V for a fully charged battery. Running cold batteries shouldn’t cause any permanent damage but it can mean you have to charge them a lot more often. Make sure you bring them up to room temperature before doing this, because charging them when they’re cold can permanently reduce their capacity. Luckily the solution isn’t too difficult – keep your batteries warm. In the UK, unless you’re stuck in a snow hole up in the Cairngorms or something, just keeping your mod and spare batteries in an inside pocket should be adequate. That way they won’t use as much power to activate their internal chemistry every time you press the button, and your battery life should be close to normal. 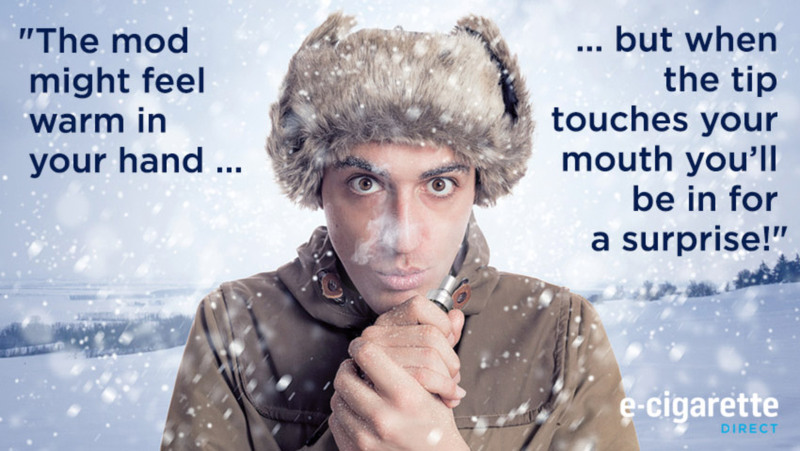 You probably wouldn’t expect to have any problems with your e-liquid in cold weather. After all the ANTZ keep telling us it has antifreeze in it, so that should be fine. Well, not exactly. The other reason is that it freezes at a distinctly chilly -59°C (-74°F), and if you’re caught in that sort of temperature you probably have bigger worries than not being able to vape. The other main component is vegetable glycerine, which is slightly more complicated. 100% pure VG freezes at 13°C, which isn’t all that cold at all, but as soon as you start mixing it with anything the freezing point falls away steeply. Mix it 2:1 with water and it stays liquid down to -46°C, which is why glycerine is also used as a non-toxic antifreeze. In fact most liquids have a higher freezing point when they’re pure, and e-liquid has enough ingredients that it’s going to take some pretty extreme temperatures to freeze it. You can start having problems long before you reach freezing point though. Cold liquids tend to become more viscous, and that means they don’t wick as easily. A setup that keeps your coil perfectly fed in summer could struggle badly in winter, either causing dry hits or even burning out cotton wicks. Think how gloopy a bottle of e-liquid is right after you take it out of the freezer. 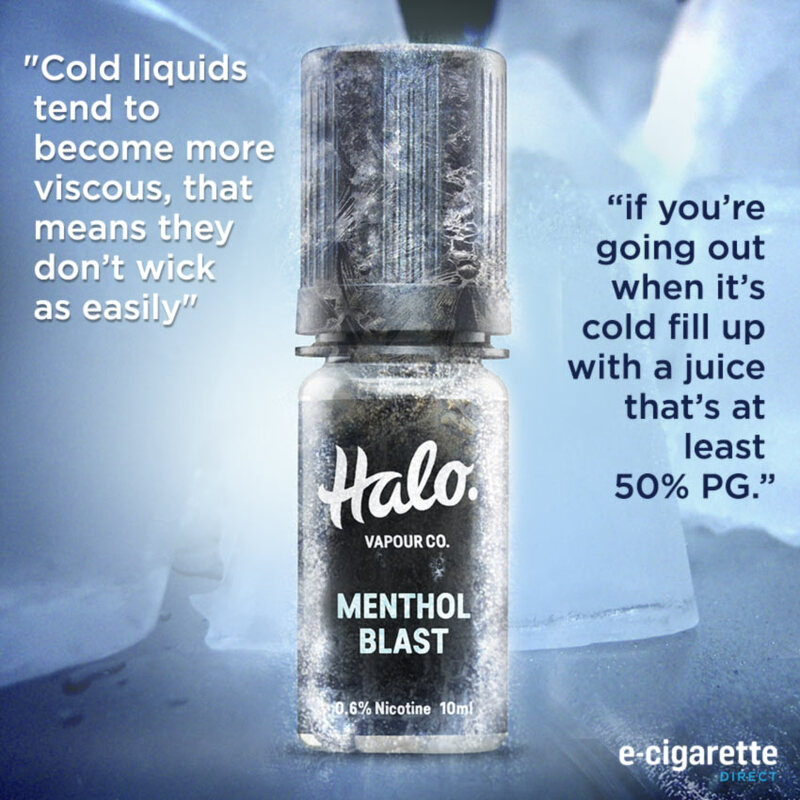 Most of that is down to the VG content, so if you’re going out when it’s cold fill up with a juice that’s at least 50% PG. If you’re sensitive to PG don’t try thinning the liquid with distilled water instead. That works fine indoors, but out in the cold it’s a different story. As soon as the VG content drops below 66.7% the freezing point starts to rise again, and while it’s unlikely to get cold enough to freeze the liquid it will get viscous at a much higher temperature. Consider using a dripper instead; they’re very cold-resistant. Modern sub ohm tanks are designed to handle high-VG liquids at room temperature, so they should work fine with 50% PG even when it falls well below freezing. Rebuildable tanks might need some tweaking to keep performance up though. If yours has a juice control, just opening it up a bit should keep things moving; if it doesn’t try switching to a higher capacity wick. More open coils can help, too. What definitely won’t help is a very elaborate coil. The more wire that’s in it the more energy is required to get all that cold metal up to vaping temperature, which increases drain on your battery. Obviously if you keep your atomiser warm the liquid won’t thicken up as much; what’s in your tank should be fine, because it’s sitting on top of your mod and that should be in an inside pocket; keep your bottles in there too. A mod, or a tank full of liquid, can hold a considerable amount of heat. That means it usually takes a while to fall to the temperature of its surroundings. A drip tip is much smaller though, and these days they’re mostly made of steel. Many of them have insulating bases to prevent high-powered coils from overheating them – but in freezing weather the same insulation means the drip tip can quickly get a lot colder than the rest of the device. The mod might feel warm enough in your hand, but when the tip makes contact with your mouth you might be in for a bit of a surprise. An unwelcome fact about metal is that, below freezing point, your skin tends to stick to it. That’s unfortunate because being in contact with frozen metal is a very quick and effective way to get frostbite. The sensitive skin on your lips is particularly vulnerable to that, and it can be a painful experience. Switching to a non-metallic drip tip in winter is an excellent idea – POM or other plastics are ideal. Winter vaping isn’t all bad news. If you’re not the sort that likes to draw attention to yourself a cold day is ideal; everybody will be exhaling clouds of vapour, so you’re not going to stand out as much. Your clouds are going to be denser of course, because what you exhale will condense into large droplets more quickly in the chilly air, but it’s still less noticeable than in summer. Other people’s breath is actually quite an interesting topic all by itself. When everyone is exhaling visible plumes you get a good idea of just how much you’re exposed to what they breathe out, and a fair amount of that exposure is going to be riddled with bacteria and viruses. The reason we tend to get more colds in winter is nothing to do with the temperature; it’s because we tend to spend more of our time indoors, with other people, in a warm and humid atmosphere. That’s an ideal climate for germs to hang around in the air waiting to be inhaled, so they can infect their next victim with a cough, runny nose and all the other delights of the common cold. There hasn’t been any research done on this yet, but it seems likely that vapers are going to be less vulnerable to this than most other people. After all PG isn’t just an antifreeze; it’s also a very effective disinfectant. It kills most bacteria and viruses on contact, so if your mouth and throat are constantly being filled with it your respiratory system is going to be a pretty inhospitable place for any nasties you breathe in. As for that exhaled vapour that puritans love to complain about, it’s almost certainly doing them at least some good by reducing the load of germs in the air. Don’t expect any gratitude, of course; anti-vapers don’t work that way. Don’t forget all the opportunities to enjoy a seasonal vape. Cigarettes might work the same in any weather, but they also taste the same. 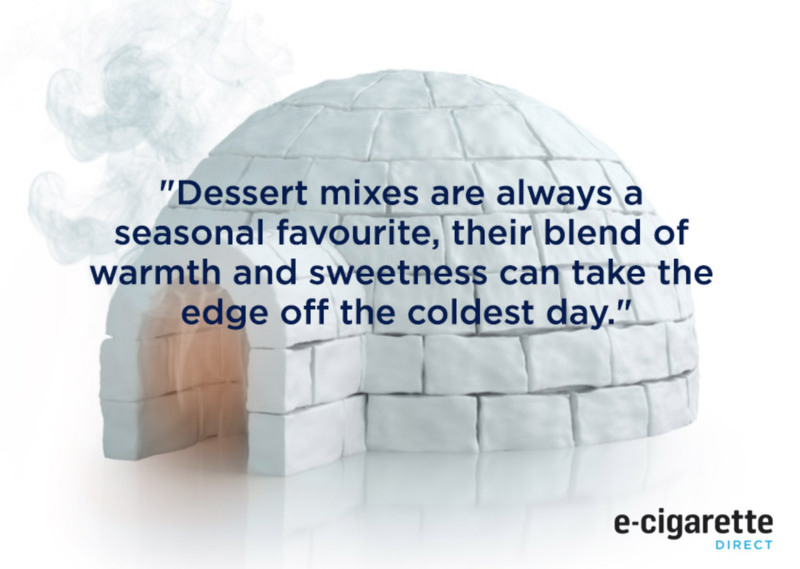 A huge advantage of vaping is that you can choose from an almost infinite variety of flavours, and lots of them are ideal for winter. Dessert mixes are always a seasonal favourite, for example – their blend of warmth and sweetness can take the edge off the coldest day. Pub smoking areas can be great in summer, especially if it’s in a beer garden, but they lose a lot of their appeal when there’s a couple of inches of freezing slush on the ground and the wind seems to be blowing straight from Siberia. Find yourself a vape-friendly local and you can enjoy nights out the way they used to be – indoors. If pubs that take a less enlightened attitude see their custom falling off they might even reconsider, especially now that the tide of evidence is running our way. Even when you are vaping outside, you’ll keep finding little things to smile about. Remember how inconvenient gloves were as a smoker? They made it awkward to hold a cigarette, plus they always ended up smelling of stale smoke and quite often got scorched as well. Your scarves and hats won’t end up smoky either. 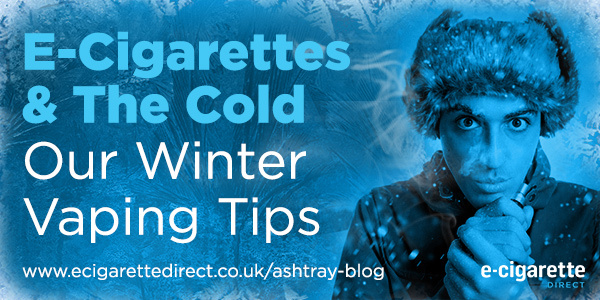 So vaping in cold weather benefits from some planning, but if you follow these simple tips you shouldn’t have any problems. The essentials are to keep your batteries warm and make sure your juice is going to wick properly. Simple things like keeping your device in an inside pocket and not leaving your gear in the car overnight will make all the difference. If you can manage that you should find your e-cigarette working flawlessly, even when there’s snow on the ground and the thermometer is reading like it’s spent all day in the freezer. There’s no real inconvenience or cost involved in switching to a more winter-friendly vaping style, and the results are definitely worth it. Thanks for writing this! I already use a non-metallic drip-tip, so no worries there! Didn’t think about the effect on e-juice however. Thanks, Shona, hope you find the post useful even if you already clued up on drip tips! Very helpful tips. Never know that winter and the cold could cause something like this on e cigarettes. I need to check what’s available for my mod now and apply these tips. Thank you very much! keft my vape in the truck last night, need my nicotine. From what I understand as long as i warm it up before i use it or plug it in, it should be fine? I have both the vape and the e-juice tucked between my balls and leg for warming purposes. Should i put it in a microwave or oven? Should I stop making bad jokes? No really though, I’m warming it up between my legs. Hope it doesn’t blow up on me because I left it out in the cold. I’m a teacher, and our building is very strict on not having any tobacco products inside. Of course, we know that e-juice is not tobacco, but the state I’m in still defines it as a tobacco product. So, while nobody would ever see it tucked inside a coat pocket, there’s always the chance …. and imagine what a big deal it could be if a student snuck into my classroom while I was in the teacher’s lounge at lunch and got curious and started snooping. Highly unlikely, but not a risk I’m willing to take. Still, it’d be nice to be able to go outside and have a vape during my lunch period, but that would entail leaving my device inside a cold car during these midwestern winters. hi, nice advices, very helpful. hey Rob, when i leave my e-cig in my car when it’s cold, i always put it inside a scraper-glove, you know those comfy glove with a windshield scraper at the end of it .. anyway, it gets cold but i can vape it without problem. thanks again for the interesting topic !